【Advanced Swim Goggles】 Fashion streamline swimming goggles with resistance reducing designing. Perfect for swimming competitions trainings and water sports. Lightweight and stylish look with no bulky feelings. 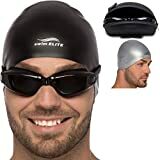 A great gift for swimming lovers. Fit nicely among men, women, teenagers, kids, etc. 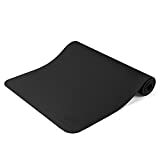 【Comfortable & Secure Fit with No Leaking】 Advanced ergonomically 3d no leaking seal for eyes & face contours with adjustable double-strap design. 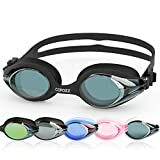 Swimming goggles made from odorless and hypoallergenic silicone & shatter proof pc. Safe , healthy & comfortable for your choices (BS 5883, SGS & ISO9001 approved material). 【Undistorted Peripheral Vision】 Patented curved polycarbonate lens with 180-degree field of vision. Class panoramic vision clear lens perfect for indoor and outdoor. 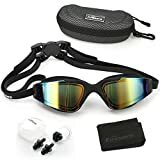 Anti-fog swimming goggles with unrivaled clarity enables long distance clear view under water. 100% UV protection and its mirror coating cuts off the glare and gives wider and safer no distraction vision. 【Elastomeric Technology】 Double straps with adjustable buckle, swimming goggles with upgraded soft silicone frame and gasket reduces pressure around your eyes and head, would not squish your eyes and leave enduring marks on your face like most common eye cup goggles does. No more raccoon eyes. Fit snugly but never allow water leaking in. Comfortable and easy to wear and take off. 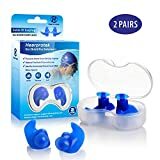 【Easy to Adjust & Best Fit】 Swim goggles with soft silicone nose bridge for best fit, no more nose piece digging into your nose and only stays comfortable. Come with FREE protection case. Easy for maintenance and storing. 30 days money back guarantee. 100% satisfaction guarantee. If you have any questions, please feel free to contact us. We will always value your precious opinions.